Cash advance loans have been around for a long time. Also known as Fast Cash, Quick Cash, or Payday Loans, these loans have in recent years exploded in popularity due to their easy qualification terms and quick turnaround times. Cash advance loans fall into the category of personal, unsecured loans. They also must be categorized as very expensive short-term loans. There are many brick-and-mortar businesses that make these types of loans in person. Cash advance loans can also be done completely over the internet. Loan, payments, and all required information are handled electronically. These loans do not require a credit check. The lender bases the loan decision instead on a few criteria that most people can generally meet. The applicant must be employed, with at least a minimum monthly income. This minimum varies with individual lenders, but many times it is set at around $1,000 monthly. The applicant must also have a checking account in good standing that can accept direct deposits. Why would you want to get an extremely expensive loan? For some, there simply may be no other alternative. If bad credit is a hindrance, a personal loan from the local bank or finance company would be out of the question. Cash advance lenders do not check your credit report. Perhaps you need the money quickly, within twenty-four to forty-eight hours. These lenders specialize in just such promptness. And you can use the money for any purpose that you need. Let’s say that you have a very important bill to pay, and you don’t quite have all of the funds necessary to cover it. If a late payment would be reported to the credit bureau (such as a mortgage payment, for example) or trigger a higher interest rate for future payments (as with many credit cards), then it might be cost-effective to utilize a cash advance loan. Notice that we said cost-effective; not inexpensive. When annualized, the cost of the loan would typically yield an APR of 500% or greater. However, if paid off quickly as they are meant to be, the high annual percentage rate realistically does not come into play. A twenty- to forty-dollar fee per hundred dollars borrowed could be a viable alternative to a lower credit score or higher interest payments, both of which could cost you much more money for many years to come. The downside of cash advances, as previously stated, is that they are very expensive. They are high-risk for the lender, since they are funded with no credit check and very basic information about the borrower. The lender, therefore, charges much higher interest rates to cover any bad loans that are made, and to ensure a profit. This is also why the loans are generally limited to modest amounts (usually no more than $1,500) and the term lengths are kept very short, regularly two-to three weeks. When comparing cash advance loans, look for lower fee amounts (lenders usually charge a flat fee of, say, $30- to $40 per hundred dollars borrowed, per term length). A longer term will also work to give you a lower APR. 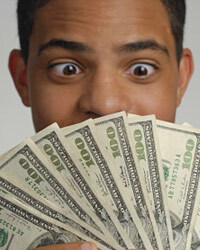 The table below lists several of the better cash advance lenders. Each offers a definite advantage that could suit your individual needs. As with any other loan, do your homework. Gather information on the lender, as well as the loan package that is offered. Cash advance loans can serve a beneficial purpose if used wisely. Be careful and use sound judgment.